Figure 9.16. Exocrine pancreatic insufficiency in 2 cats. 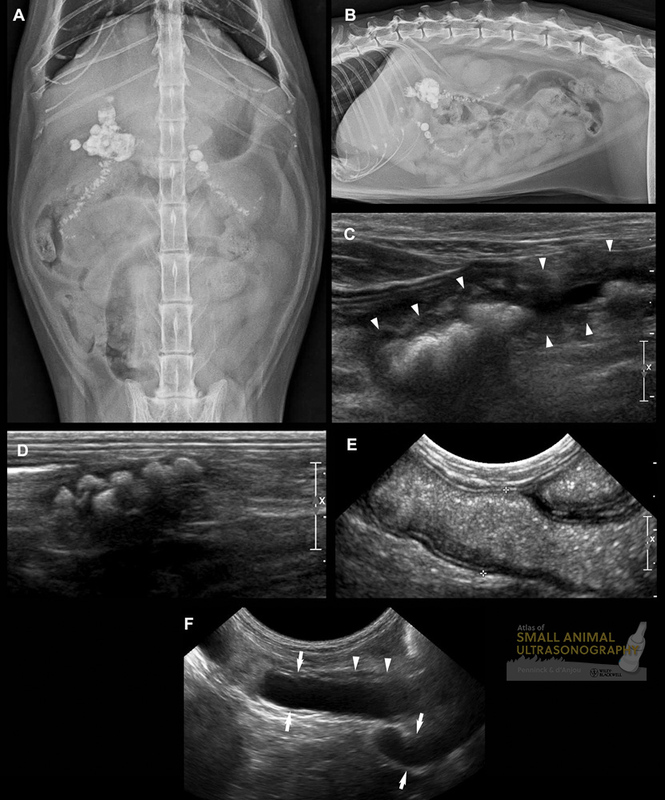 In this 17 year old DSH with chronic pancreatitis, the ventrodorsal (A) and the right lateral (B) radiographs showed this long string of calculi along the trajectory of the entire pancreatic duct and suspected to be also in part of the biliary system. On ultrasound, there are numerous irregular calculi (C and D) associated with shadowing. The pancreatic tissue is barely seen in this cat (arrowheads). The intestines of this cat (E) are hyperperistaltic and dilated (1.3 cm) with echogenic contents; this may support the malabsorption seen in EPI. F: in this 14 old year cat, the pancreatic duct was moderately dilated while the pancreas was nearly inexistent. No calculi were present in the pancreatic ductal system. So….what were the calculi associated with? Were they biliary? The calculi were primarily seen within the pancreatic duct. Pancreatolithiasis is uncommon, but reported concurrently with exocrine insufficiency.